Nearly 20 years ago, when I graduated from medical school, the world of healthcare was dominated by breakthroughs in the field of biology. But, that is changing quickly because biology is being eaten by robotics and genetics as we evolve deeper into the networked age. What does this shift mean for doctors, patients and even hospitals? As the co-chair of the World Economic Forum’s Future Council on neuro-technology and brain science, I was asked to reflect on my experience in this domain. By the way, you know you are getting old(er) when you are asked to reflect. Back when I started out in the 1990s, the discovery of protease inhibitors - a class of antiviral drugs - helped change the clinical course for HIV positive patients, while vaccines for conditions like hepatitis C and Lyme disease saved a generation from unnecessary suffering. It was a fertile time too for headline writers: Viagra, a little-known agent used to treat pulmonary arterial hypertension, quickly changed the outlook for erectile dysfunction. And who could forget Dolly the (cloned) sheep? Biology appeared to be ushering in a brave new world, while innovation in medical chemistry and physics lagged behind. Advances in radiology and laboratory science brought faster and better results from smaller and easier tests, but not many breakthroughs. The biggest leap forward was in almost universal access to hospital-based imaging equipment like X-Rays and CT scans, but the cost and functionality of “newer” technologies like MRI and PET scans were still being debated. Largely off the clinical radar, a different type of science was emerging that would have a massive impact on the way we think about patient care: communications technology. While many of us quickly embraced the internet, email and 2G mobile phones, there was no immediate link to our medical practice - except bragging rights for owning a clunky flip phone with a 30-minute battery life. We had to hand-write all of our notes in the medical record, carry around a heavy patient chart, call the operating room to figure out scheduling and wear an annoying pager that would beep incessantly. We didn’t even use the word “landline” because mostly, no one knew there was another kind of line. Other than the pager, “luxury” gadgets just weren’t part of the hospital system. There were very few applications for artificial intelligence and "big" data meant 18-point font spreadsheets. Fast forward to 2016. I survived all of my training (barely) and now walk the hospital corridors as an attending physician guided by those proverbial four words: first do no harm. That mantra frames my aspiration to respectfully provide my patients and their families with the most accurate diagnostic information, the least-invasive interventions possible and the safest therapeutics available. I am as excited as my patients are to learn about innovation and wellness - but I provide all that care in a hospital. Telemedicine is gaining ground, but it feels a little more like a communication tool than a doctoring one, at least to those of us whose patients require interventions other than advice. Sure we now have comprehensive electronic medical records and the ability to order a zillion medical tests, but truly personalized care is still a few years away. And just in case you think doctors are good at change, I would like to point out that we continue to schedule bedside rounds and family meetings around procedure and staffing schedules in pretty much the same way we have done since the early 1900s. However, when I look towards the future I see a very different trajectory. Who needs a hospital when you can prevent or treat conditions from the comfort of your home? The global burden of disease is largely vascular, with heart attacks and strokes the biggest cause of death around the world, and therefore preventable with a better understanding of risk factors. Rates of traumatic injury are falling and will continue to decline as we introduce driverless cars and robot workers for risky tasks. And really: 80 is the new 60, with all of the regenerative options on the horizon. By 2030, the very nature of disease will be further disrupted by technology. So disrupted, in fact, that we might have a whole lot fewer diseases to manage. The fourth industrial revolution will ensure that humans live longer and healthier lives, so that the hospitals of the future will become more like NASCAR pit-stops than inescapable black holes. You will go to hospital to be patched up and put back on track. Some hospital practices might even go away completely, and the need for hospitalization will eventually disappear. Not by 2030, but soon after. Instead of a ward filled with patients who have one or more organ system in crisis, space will be dedicated to immediate diagnosis and treatment. A single scanning device will offer metabolic, functional and structural detail – combining the physics of spectroscopy, magnetic resonance and radiation. This will mean you only need one scan, and no biopsy. An end to organ donors. Surgery from the inside out. Wearable patient-monitoring devices will continuously feed in data from external second-skin sensors and networked neural sensors meshed into the brain will offer incredibly precise “micro-sampling” to be done in real time. Hello, neural lace. 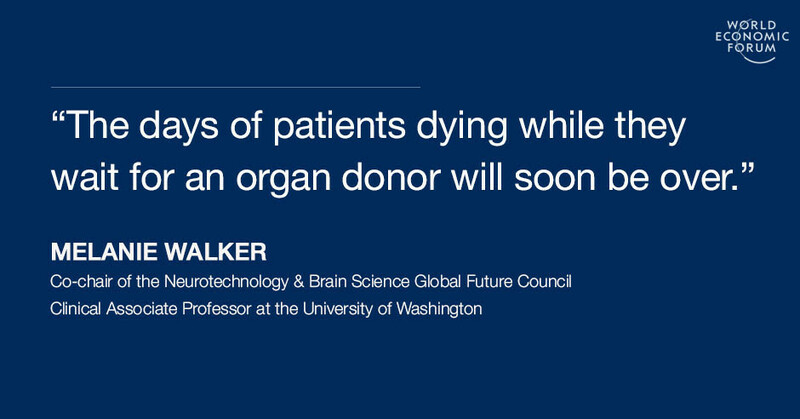 The days of patients dying while they wait for an organ donor will soon be over too. Organs, tissues and supporting structures like bones or ligaments will be biologically 3D-printed on demand. Acute and serious pathologies, ranging from clots to tumours, will be addressed from the inside out. No need for surgeons wielding scalpels with a steady hand, when in a few minutes, tiny robotic endovascular catheters will be widespread. Instead of doctors considering what medication the patient should take and then nurses or pharmacists administering it, your mobile device will receive the necessary information to print a menu of custom pharmaceuticals and probiotics on demand from your own living room or kitchen. All of this will happen within minutes. If you think this sounds crazy, think again. Most of these technologies are either almost ready for prime time, or in development. Doctors like me are going back into training to master endovascular techniques and those of us with computer science skills are pushing hard to integrate digital tools into our field of practice. 3D printing is yesterday's news. On-demand pharma companies already exist. Neural lace - a brain-machine interface - is about to be science fact, and not science fiction. Next stop? Not the hospital but the home-spital. Of course there are still a few things we need to work on to be sure we can stay apace with innovation: an enabling regulatory environment, funding for research that links the moon-shooters with the people who can make their big ideas happen, and more women in science and technology. One thing is certain: the prognosis for the hospital of the future involves radical change - and a lot more electricity. Let’s dream a little. Melanie Walker MD is the co-chair of the Neurotechnology & Brain Science Future Council and Clinical Associate Professor of Neurology & Neurological Surgery at the University of Washington with an adjunct appoint at Johns Hopkins School of Medicine.